The events of September 11 affected us all in different ways. For us, it was significant introspection. September 17th, we decided that as we proceed into an even more uncertain future, we should face it together as husband and wife. 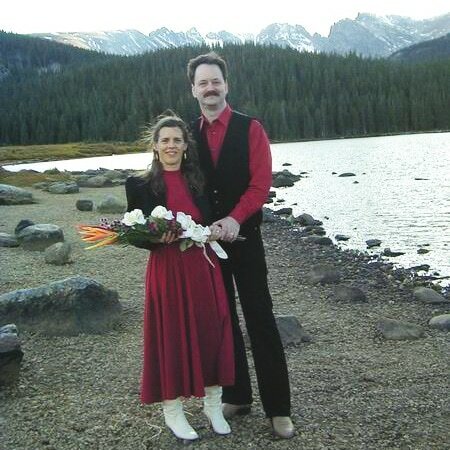 We married at Brainard Lake in the mountains above Boulder with our good friends Tom and Amy as our witnesses. As allowed in Colorado, we officiated at our own marriage ceremony. Our names will remain the same. Thanks to our many friends sending best wishes. We ask, however, that well-wishers not send online “greeting cards”. One is cute, two is nice, dozens is a pain, hundreds make it a nightmare. (Plus we’re not really all that interested in having every online greeting site having a record of our e-mail addresses — an aspect you should consider too!) Thank you!